' This experience is the fulfillment of his Life.I have overcome the fear of Death'. The Royal Bengal Tiger is undoubtedly the smartest and handsomest of all the creatures. No wonder they call him the King. He is India’s most valuable possession. And like his Homeland, India, he too possesses that Mystical Aura; an aura that enchants the Body; captivates the Mind and transcends the Soul. What is man, a puny and tiny biped, compared to the Awesome Tiger! Just take away the gun and gunpowder and the Tiger will re-establish his Reign. Dudhwa is very prominent and well protected Tiger habitat. Some 100 tigers dwell here. These big cats have adapted themselves to all the three habitats of the Park. 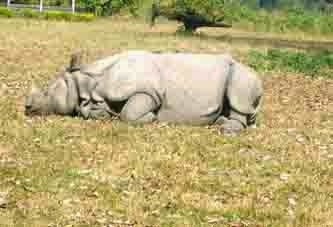 The Great Indian One-Horned Rhinoceros once lived in the Grasslands of the Terai. The last rhino was slaughtered in 1878. 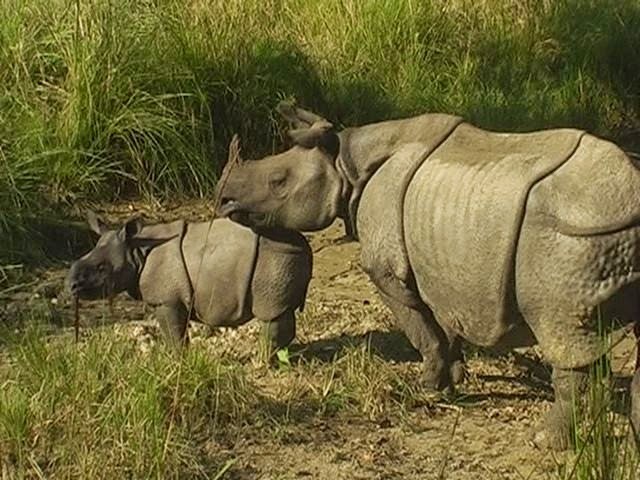 With the success of project Rhino, a veritable Jurassic Park has been raised at Dudhwa where a long extinct species has been revived. 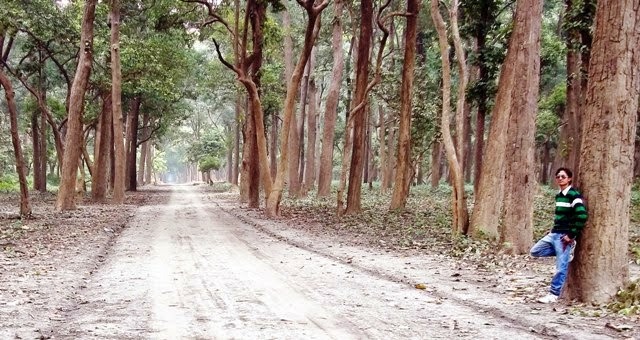 "It was a pleasure driving on the forest dirt track canopied by the tall Sal tress. We soon reached the awesome Jhadi Tal. A number of migratory birds graced the waters of this huge water-body. On the far end, we spotted a large herd of Barasingha (Swamp deer); a harem dominated by a solitary handsome stud in the company of some 24 females (Wow!). They were squatting on a circular island like mound. Two pythons had made their nest just about 500 yards away from our vantage point. We made our way to the second watch tower. Here we saw an even bigger herd of Swamp deer. I counted 47 of them. Most of the members of the herd were males; their mighty antlers glistening brightly. The herd was waiting for dusk so as to proceed concealed from the Tiger into the jungle to munch soft grass. This was the largest herd of a deer species, I had ever seen. In fact, Dudhwa is the last refuge of Northern Swamp Deer. " 'One sunny afternoon, near the Nakauah Stream at Dudhwa, I was accompanying a group of budding naturalists. We were trying hard to spot Crocodiles and Gavials. We sighted three huge crocs. One of them, still as log, seemed to be sunbathing. The other two were partially submerged in the waters. We moved very carefully nearer to the stream to take a better look. And Lo and behold! With a swift movement, a crocodile was out of the waters and came hissing right at us. We were caught off guard and scurried for safety. Dr.R L Singh(The founder director of Dudhwa) was trying hard to convince the Scientists about the feasibility of Rhino project project at Dudhwa. Even destiny worked in favor of Dudhwa. One fine day, a strange bird suddenly appeared before the experts. This was the Highly Endangered Bengal Florican. This bird had not been sighted for the past two decades. It was a wonderful omen. This bird shares its habitat with the Indian Rhinoceros. And its presence was a positive indicator of the ecological health of Dudhwa. 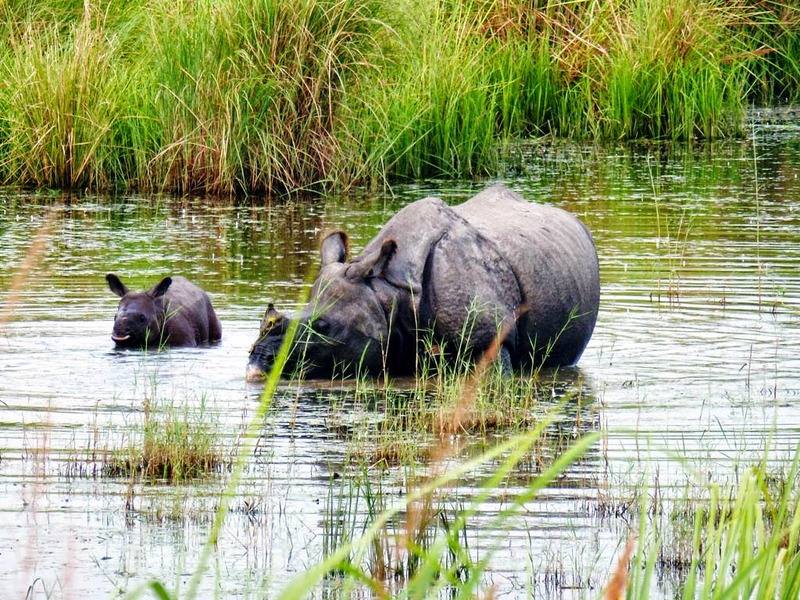 This event helped clinch the Rhino Rehabilitation Project at Dudhwa. 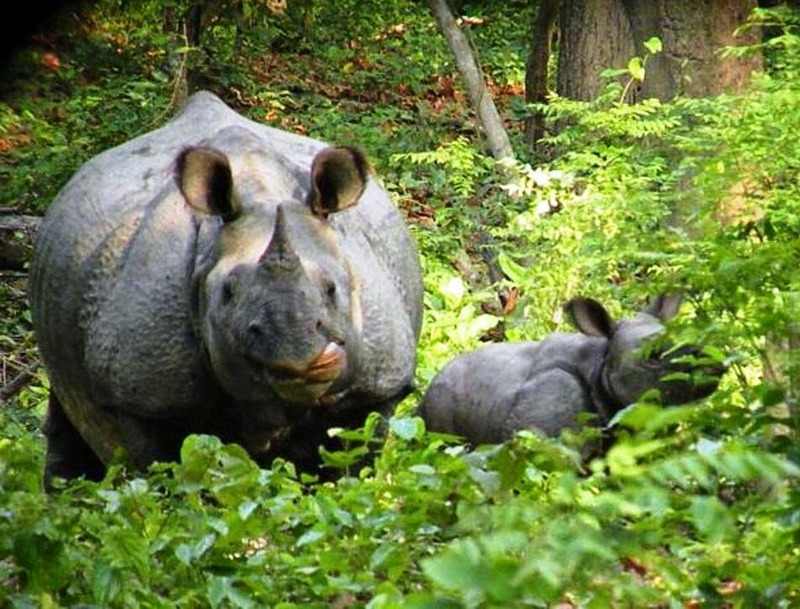 The Dudhwa National Park is spread over 490sq km along with a buffer area of over 100 Sq km. Besides massive grassland and swamps, Dudhwa National Park is home to one of the finest Sal (Shorea robusta) forests in India. Some of these trees are more than 150 years old and over 70 feet tall. In 1976, the park had a population of 50 tigers, 41 elephants and 76 bears apart from five species of deer, more than 400 species of birds, crocodiles and some other species of mammals and reptiles. Dudwa National Park is a stronghold of the barasingha/ swamp deer, which can be spotted in herds of hundreds. 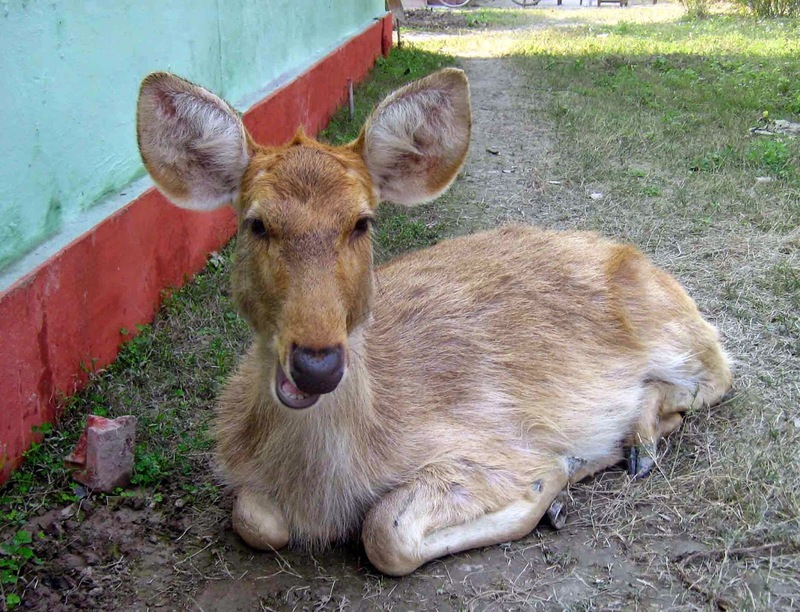 India is the only country where this species of deer is found. It is interesting to note that around half of the total Barasinghas on the Earth are present in Dudhwa National Park. Smaller than the sambar, the barasinghas have 12 antlers that collectively measure up to 100 cm. A full-grown stag can weigh as much as 180 kg and measure 135cm. The coat of the animal is slightly woolly, dark brown to pale yellow, adapted perfectly to camouflage in the tall grasses of the area. 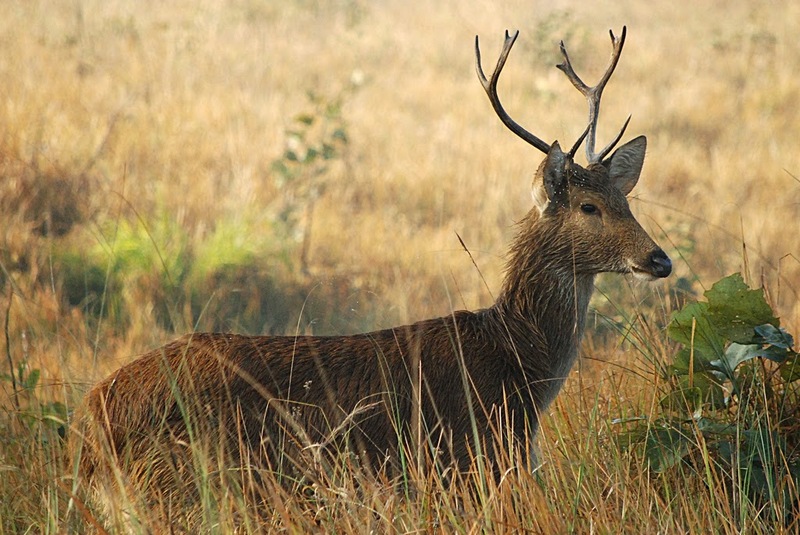 During the winter season the swamps of Dudhwa echo with the frequent wallowing of rutting stags. This is also the time for mock fights that entail stiff postures and shrill calls rather than the actual locking of the horns. With the onset of spring the herd gets ready to welcome the newborn fawns. With the passage of winter the Barasinghas shed the woolly coats. During this point of time the fights amongst the male Barasinghas are minimal. 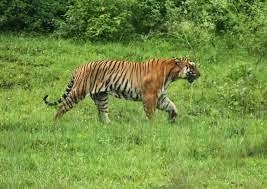 Tiger is another major attraction of the Dudhwa National Park. There was once such a time when Dudhwa was severely affected by man-eating tigers for which the structure of the Park was held responsible. Dudhwa is probably the only Park that doesn't have adequate buffer area to support the main wild/ Park. This is bound to create conflicts between human beings and animals. Besides the abovementioned animals, the avian life at Dudhwa is a delight for any avid bird watcher. The marshland of Dudhwa national park is home to around 400 species of resident and migratory birds that include the Swamp Partridge, Bengal Florican, Great Slaty Woodpecker, plenty of painted storks, owls, barbets, woodpeckers, sarus cranes, minivets etc. It is to be noted that much of Dudhwa's avian fauna is aquatic in nature and found around lakes. 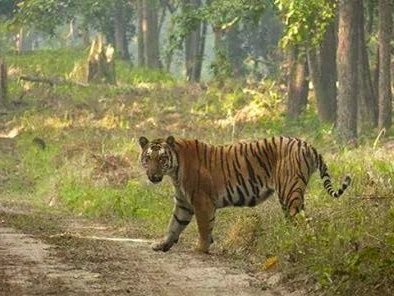 The major vegetation types in and around Dudhwa National Park are tropical semi-evergreen forest, tropical moist deciduous forest, riparian and swamp and dry deciduous forest. The dominant tree species are Shorea robusta, Eugenia jambolana, Terminalis tomentosa, Terminalia belerica, Adina cordifolia, Dalbergia sissoo, and Bombax malabaricum. Stretches of mesophyllous grasslands, locally called the phantasm, interrupt the forests at many points in the National Park. You can hire Jeeps and mini buses to move around inside the Dudhwa National Park. Besides the Jeeps and mini buses you can also enjoy Elephant rides through tours. Usually the mahouts /Elephant drivers double up as guides. The best time to visit Dudhwa National Park is between November and May. The park remains open to public from November to June, though the months of May and June are a little too hot for comfort. While visiting the Park during winter you must remember to take woolen clothes as it can get pretty chilly, particularly between December to February. 7:00 AM to 10:00 AM and 3:00 PM to 6:00 PM. Air : Lucknow is the most convenient airport. Indian Airlines operates a number of flights to Lucknow from major cities across the country. Rail : The nearest railheads are Dudhwa (4 kms), Palia (10 kms) and Mailani (37 kms), however the most convenient way would be to travel to Lucknow and hit the road or take a train to any of the nearer stations from there. Road : The State Roadways buses and private bus services link Palia to Lakhimpur Kheri, Shahjahanpur, Bareilly and Delhi. Buses are frequent between Palia and Dudhwa. Start your journey of India from Dudhwa, it is advisable to travel to the Nepal airport and take one of the number of transport means available from there. To travel by road from Delhi, take the NH24 to Shahjahanpur via Ghaziabad, Moradabad, Rampur and Bareilly. A district road from here will take you to Dudhwa via Pawayan, Kutar, Mailani, Bhira and Palia. Casino- Night stay in Nepal. Rs.14990/=* for Two Persons, with Deluxe stay, including meals. Rs.16990/= * for Two Persons, with Deluxe stay, including meals. Rs.25990/= * for Two Persons, with Deluxe stay, including meals.